After studying the oil-free, plant-based, whole food movement for around a year and a half I was diagnosed with pre-diabetes. I knew I could reverse that from all of the reading I had done. But I had tried going plant-based before and got great results regarding weight loss but I could never last more than a few weeks. Thankfully someone around my diagnosis mentioned the Protective Diet so I immediately looked it up. I saw no sugar and I thought there was NO way I was going to be able to give up sugar. But the more I read the more it made sense. All the plant based doctors I had been studying gave me an understanding of why the food I was eating was bad for me and what I should be eating. What I loved about Protective Diet was the structure I so desperately needed. I joined the PDL FB group and hung out for a couple of months finding reasons not to start yet before I finally started PD on January 5th. During my detox, my boyfriend’s Mom was diagnosed with a fast-growing brain tumor so we had to rush an hour away to be with her. I had no food on me because I hadn’t learned to stock my fridge with prepared meals yet. Even though I went hungry a few times around her diagnosis I never ate anything off plan. Once I started PD I was completely focused. I quickly learned what meals were easy to pack for when I was going to be away from home. I also had to figure out how to eat in places his parents liked which didn’t tend to have very many options for me. I watched some archived classes and started to prepare food for the week and suddenly always being gone wasn’t a problem because I had food to take with me. The first month I lost 22 pounds and went from a size 20 to a size 16. I skipped size 18 completely. I felt great so I kept following PD. I found my weight loss slowed down but I would lose in clusters. As I lost weight I skipped size 14 too. After about 4 and a half months I was a size 12. 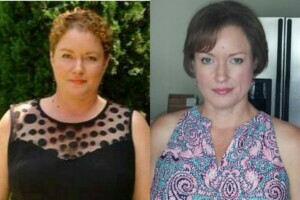 I had to have major surgery and my two friends who had a similar surgery even though they were pretty thing before both gained weight after. Thankfully I stuck to PD meals and 6 weeks after surgery I am still losing. I haven’t had physical food cravings since around week 4 and I no longer struggle with eating disorders. I am bipolar and my moods have totally stabilized and I am much happier. I use to stay in bed until 2 in the afternoon because there was no reason to get up. Now I get up and get showered and am excited about my day. I started wearing make up again. I have goals for my future now. Even though I still have about 30 pounds to lose I am out doing things I wouldn’t of done before. I feel comfortable in my skin for the first time in many years. I will be 45 this month and I have more energy than when I was in my 20’s. I love the food I eat and I am not going hungry and counting calories to lose weight. If you are waiting for the right time to make this change I recommend you just jump in and start PD. This is the best thing I have ever done for myself. I love that I eat delicious food and I do not have to feel guilty or worry about gaining weight because I cheated on my diet. The food is so good I feel like I am cheating but everything I eat is healing and nourishing my body. I use to hate to cook but following Julies recipes couldn’t be easier or more fun. I love being in the kitchen now. I am no longer sitting on the sidelines. I am out creating a life that I love and am excited about. All of this because I decided I didn’t want diabetes so I changed the way I ate. I never dreamed that by taking that first step I would completely transform my life. The online support from PDL is amazing. They encourage me by what they post and how they respond to what I post. This is how I will eat for the rest of my life. What an amazing and inspiring testimonial, Allison. So glad for you!! So glad to read your 6 month story. You have made so much progress. PDL is a wonderful community. You have encouraged me too and I can’t wsit to ser what the next six month brings. Thank you! I am so excited seeing your progress too! Keep posting! Thank you so much for all your support and encouragement Tece! I look forward to getting to know you more as we are on this journey to optimal health together.